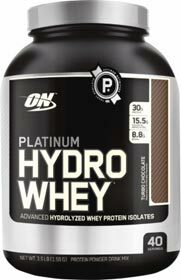 Platinum HydroWhey by Optimum Nutrition is a premium whey protein supplement - it consists of hydrolyzed whey protein isolates. You might be wondering what a "hydrolyzed" whey protein is... Basically, a hydrolyzed protein is a protein that has been "broken" down into its component amino acids, and through this, it is much faster absorbing, and gets to your muscles much faster. We'll discuss this in a bit more detail later on. HydroWhey protein is also a pure hydrolyzed whey protein isolate - containing no other types of proteins. This is what makes Hydro Whey a very premium whey protein powder, and at the same time, this is also the reason why it costs so much more than a more standard whey supplement such as ON's 100% Gold Standard Whey. It may sound a bit cliché, but you do get what you pay for, and you are getting pure quality whey with this. I have been a happy customer with Optimum Nutrition products over the years, and have used a wide variety of their products as well. Their ever popular Gold Standard 100% Whey is top notch in terms of quality and price, but it falls short when you compare it to the premium HydroWhey protein. Gold Standard Whey consists of a protein blend that contains whey isolates and concentrates, whereas their Hydro Whey Platinum is a pure 100% hydrolyzed whey isolate. Obviously, this quality difference is reflected in the price difference where if you compared Platinum HydroWhey vs Gold Standard whey on a protein gram to gram basis you find that Hydro Whey costs over 80% more! This is easy to calculate... You simply figure out how many grams of protein is in a container and then divide by its cost, and then compare the two, and as we've just found out, the premium powder costs a whole lot more. Below, we list the ingredients of Hydrowhey and will also list the ingredients for Gold Standard 100% Whey as well for comparison. As you can see from above, Platinum Hydro Whey protein has a slightly larger serving size, slightly more calories, less carbohydrates, and more proteins per serving due to larger serving size. However, the biggest difference here between the two protein powders is their sources of protein. For ON Hydro Whey, it is 100% pure hydrolyzed whey protein isolate. For Gold Standard 100% whey it's a blend consisting of whey isolate, whey concentrate, and whey peptides. The one downside of it is that Hydrolyzed whey cost a lot more to produce and the extra cost is passed on to consumers, of course. As we found out earlier, the premium Hydro Whey costs a whooping 80% more than Gold Standard whey when you compared them on a gram-to-gram basis. Studies have also found whey hydrolysate to have greater benefits compared to other forms of protein such as casein. On HydroWhey comes in 1lb, 1.75lb, and 3.5lb container sizes, and it also comes in several flavors including Turbo Chocolate, Velocity Vanilla, Cookies & Cream, and Strawberry. Obviously the larger 3.5lb size is more cost effective than the smaller sizes - even so, it is still quite pricey, but that's what you pay for a premium product. Perhaps the one downside of hydrolyzed whey is that it tends to have a bitter taste, and not everyone will enjoy the taste as much. For me, I've tried the chocolate and vanilla flavors, and I didn't have any issues with the taste of the hydro whey. However, I'm sure some users may not enjoy the taste so much. But if you want a super pure and ultra fast absorbing quality protein powder, then Optimum Nutrition's Platinum Hydrowhey is what you're looking for. 1. Int J Sport Nutr Exerc Metab. 2006 Oct;16(5):494-509.